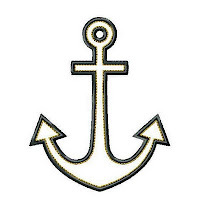 This ship's anchor is a delight to sew out. It is perfect on garments for babies and boys and looks amazing on bedlinen too. 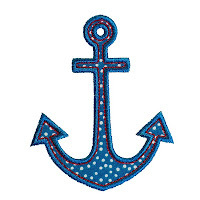 Sew out a row of them in different colors for a nautical look. There’s bound to be some fabric in your stash perfect for this project! This design features a contrast stitch of Triple-Bean against the Satin Stitch edge to bring an added look of luxury to your sew-out. 5x7 Hoop - exact sizes 5” x 4.02" and 6" x 4.81"
6x10 Hoop - exact size 7" x 5.61"